New Mermaid Art - Manda Mermaid! This painting is a gypsy tribal mermaid, in a peacock-coloured sea. It's a mermaid portrait of a friend of mine, and unusually for mermaid portraits, this one will be available as an art print from my etsy shop! 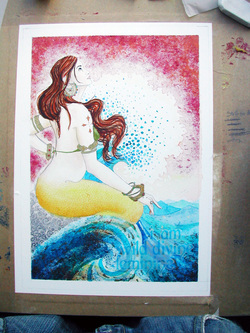 In the original, the sea is a shimmery glittery green and her jewellery is painted in gold ink. Her tail is a shimmery copper. Om nom nom. The magic of an original art piece! In art-print format, it's a bit less shiny and glittery but it's still very tasty indeed. On her tail is written "Dancing is the poetry of my feet" in an arabic script, a gorgeous tattoo my friend has been lusting after for a while. Yes, I know she is a mermaid without feet. Perhaps she can switch between land and sea, like Darryl Hannah in Splash. Thus mystery solved. I'll be doing a breakdown of how the bespoke mermaid art service step by step with Manda Mermaid, so you can see her grow from my friend's questionaire answers to the gorgeous shimmering final piece, so keep your future peepers on the blog! I finished Sulis (hooray! I'll be putting her in the Goddess Gallery soon) and I've been working on something different. Since year two of Uni, I've been working in watercolour - I fell into it and loved it as previously I was an oil painter, which is a difficult, smelly and messy business. I like clean. Tasty clean. Watercolour is gorgeous - it's fresh and clean, vibrant and you can do lots of tiny details. You can do it, then leave it, and come back to it. However, it has downfalls as well, and the main one for me is that it brings out my perfectionist streak. Because you can't change anything once you have done it, it has to be perfect the first time around. Gah! Terror. And to keep it clean and beautiful, you have to be very careful and clever. And while it's excellent being clever, it gets a bit tiresome being careful all the time and it looses it's fun. I want to enjoy painting. I don't want to start something and then spend 30 hours finishing it, and putting it off because it's all getting so tiresome. So currently taped to my desk is an exercise in fun. It's a mermaid portrait of me (yes I really am that beautiful) and i stuck all the things I have found fun from my last few projects. Gold ink? Check. Mixed media? Check. Lots of pink? Check. Stabby painting technique? Check. Time limit? Check. Goddamn MERMAIDS?! Oh hells yes. Time to rip it off, trim it down and start a new one.